As soon as Niall’s death hit the headlines I had a phone call from Athlone which informed me that Niall had visited a Solicitor in Athlone on the Thursday before his death. He made the visit with the purpose of getting advice on withdrawing form all business arrangements with the Flynn’s. I gave this information to my aunt Suzannah Ryan who along with her daughter visited the Solicitor. Both their statements are in the Book of Evidence. 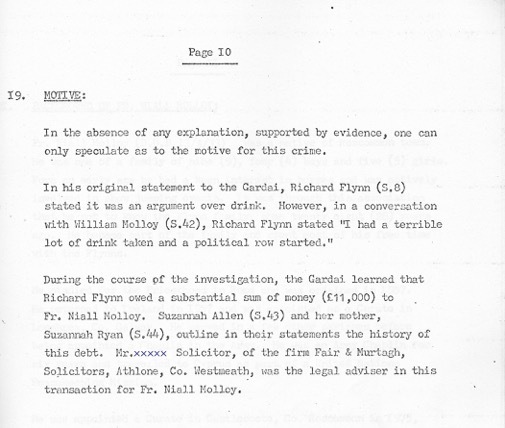 The Solicitor was also visited by two Detectives but it is only in recent years that my family have discovered that no statement from the Solicitor is included in Garda files despite the fact that his dealings with the Flynn’s was considered as a possible motive. Theresa Flynn also made a phone call to the Solicitor and asked him not tell the Molloy Family about the land deal which he had advised on. Incredibly in our final meeting with detectives from Serious Crime Review Team I asked them what was listed in the Book of Evidence as the possible motive ? They both said they did not know. The said the would have to look it up.